[PDF] Internationalization of Higher Education: An Analysis through Spatial, Network, and Mobilities Theories | Free eBooks Download - EBOOKEE! 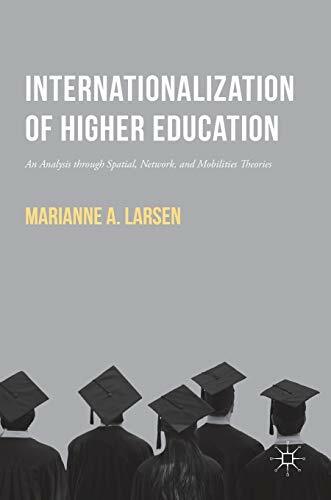 Description: This book provides a cutting-edge analysis of the ways in which higher education institutions have become more international over the past two decades. Drawing upon a range of post-foundational spatial, network, and mobilities theories, the book shifts our thinking away from linear, binary, Western accounts of internationalization to understand the complex, multi-centered and contradictory ways in which internationalization processes have played out across a wide variety of higher education landscapes worldwide. The author explores transnational student, scholar, knowledge, program and provider mobilities the production of mobile bodies, knowledges, and identities the significance of place in internationalization and the crucial role that global university rankings play in reshaping the spatial landscape of higher education. No comments for "[PDF] Internationalization of Higher Education: An Analysis through Spatial, Network, and Mobilities Theories".